Modern pH electrodes are designed to measure the amount of hydrogen ions (H+) and hydroxyl ions (OH-) that are active in a substance to determine how acidic or basic that substance is. The amount of active hydrogen ions present in a substance indicates the degree of acidity, while the level of active hydroxyl ions present indicates how basic a substance is. To measure ions, pH meters and testers use two electrodes housed within a single glass body, or what’s known as a “combination electrode.” A combination electrode consists of a pH electrode and a silver chloride-filled reference electrode, which look like two wires extending inside a bulbed glass body. The pH electrode is submerged in electrolyte solution, while the reference electrode has a small hole, called a junction, which serves to close the electric circuit and make it possible to take measurements between the two electrodes. By transmitting an electric pulse through the glass and the solution, the probes measure the voltage—i.e., reactive potential—of the substance in which they’re submerged. This voltage measurement is then used to calculate the amount of active H+ and OH- ions present to give an exact pH value. Because the chemistry of pH electrodes is incredibly sensitive and susceptible to change, it’s important to take care of your pH meter and calibrate it in the correct way in order to get the most accurate electrode readings. In addition, the porous junction will eventually drain the electrolyte solution, causing the electrode to stop working if not refilled on a regular basis. Below, we’ve outlined four best practices to help you calibrate and extend the life of your meter. The fundamental chemistry of your electrodes is bound to change with use, which can cause your measurements to drift over time. To ensure that readings remain accurate, it’s important to account for any changes to your electrode’s properties, or what’s known as offset error. Microprocessors used in pH meters typically conduct two-point or multiple-point calibration. This technique compares your electrode’s real slope to its intended slope and determines the offset error. Using this offset error and the real slope, the microprocessor will automatically adjust the measurement equation (mV/pH) to compensate for electrode changes, calibrating your meter accurately. In order to calibrate your meter for use with a specific substance, make sure that the two calibration points points chosen for calibration bookend the pH range you’d like to test. On digital meters, you can use previous calibration data and settings as a baseline. For more accurate readings, calibrate your meter daily and use the pH range of the substance you’d like to test to determine the best calibration points. Some meters offer multiple-point calibration for even greater accuracy, so it’s important to consult your meter for specific calibration instruction. Smart pH meters help eliminate human error and make calibration easier by guiding users through the calibration process step by step. Some pH electrodes are built into the body of the tester, as is the case with most testers. More commonly, electrodes are designed to be connected to meters via a cable and BNC connector, like the benchtop monitor and electrode pictured below. No matter what type of electrode you’re using, it’s important to store the electrode in storage solution rather than keeping it in deionized water. Storage solutions contain a mix of chemicals designed to prevent the growth of bacteria and prolong the life of your electrode. The most common storage solution for pH electrodes is the buffer 4 solution. Improperly storing your electrode can cause ions to seep from the glass, slowing the reaction speed of your tool. Along with storing your electrode meter properly, make sure to rinse your electrode after each use, rather than wiping it with a cloth. The static that results from wiping your meter can influence the next reading and any lint that’s transferred to the glass from a cloth will decrease the amount of exposed surface area and slow response times. 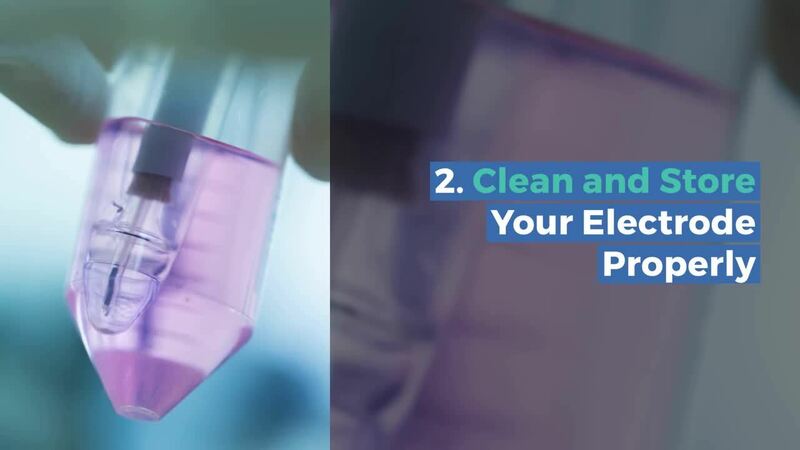 Instead of using a cloth, rinse the electrode glass with deionized or distilled water and blot any residual water with a lint-free disposable wipe. Remember that different meters require different care, so make sure to consult the product guidelines for your meter for optimal results. The way you use your electrode pH meter can dictate the accuracy of your results. When you take a pH reading, make sure that the glass bulb of the pH electrode and the junction of the reference electrode are submerged in the substance in question. Because the glass bulb is the primary interface of interaction, ensuring that the glass is fully exposed to the substance will improve both the accuracy of your readings and the response time of your meter. When determining how far to submerge your portable meter, you must understand where the electrode bulb is located and how far it needs to be submerged to cover the junction. In the above image of the Jenco Bluetooth pH/temperature tester, you can see that only the glass bulb and a small portion of the glass stem are outside of the main tester body. The exposed parts are what will be submerged, as shown in the following image, to get the quickest and most accurate reading. Most portable pH meters are designed for use with water-based substances. If you’re planning on testing soil, food, or substances with drastically different fundamental properties, make sure that the pH electrode you choose is suited for your intended use. Before making a purchase, research the features of different pH electrodes and know what environments and conditions they’re most accurate in. To browse and compare Jenco Instruments’ various portable pH testers, desktop meters, and electrodes and shop for your ideal solution, click the button below. Lorem ociosqu ad litora torquent per cobia nostra, per incepto himenaeos. numquam eius modi tempora.